Summary: In this story of the underground railroad, students can grow up with Henry; he was born a slave and dreams of a life where he and his family can be free. 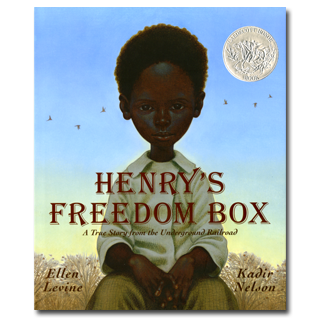 Based off of this true story the reader is brought along Henry's journey from being a young slave boy, losing his family to slavery, and a friend to help mail him in a wooden box to freedom in Philadelphia. Element 4: Social Movement and Social Change: In teaching students about social movement and change it is important that they realize that change can start with anyone, all you need is courage. Henry, although born a slave, has the courage to change his circumstances and find others who will help him, students can make connections that they can inspire positive changes in the world around them. Activity: With the your class, you can do a character study with Henry. How does his characteristics and character traits affect his actions. Using post-its students can use footprints as they read the story to mark their thoughts. Then with a graphic organizer, students can list out different traits and the textual evidence that is supports these traits. At the same time students can record any questions or information they want to explore more. Through these students can create a project that is rooted in social justice, with a cause they want to help or a way to create social change. Visit Teachers Pay Teachers to find more lesson resources!